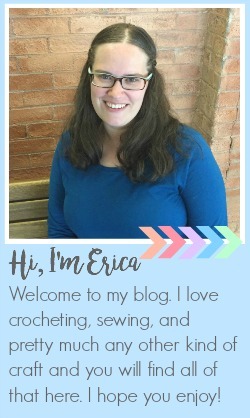 Yesterday I shared a new pattern over on the Fairfield World Site and I thought I should share it here too. This time of year is all about Dad's and Grad's, men and teenagers/young adults, probably the two hardest groups to make handmade gifts for. I have no problem at all coming up with gift ideas that I can make or new babies, little kids are pretty easy too. Feminine gifts are also easier come up with but something handmade and at all masculine is a little bit more difficult. I wanted to try to come up with a gift idea that could work for either of those groups, either as a Father's Day gift or as a gift for a recent grad. One thing that it seems like those two groups have in common is their love for technology. 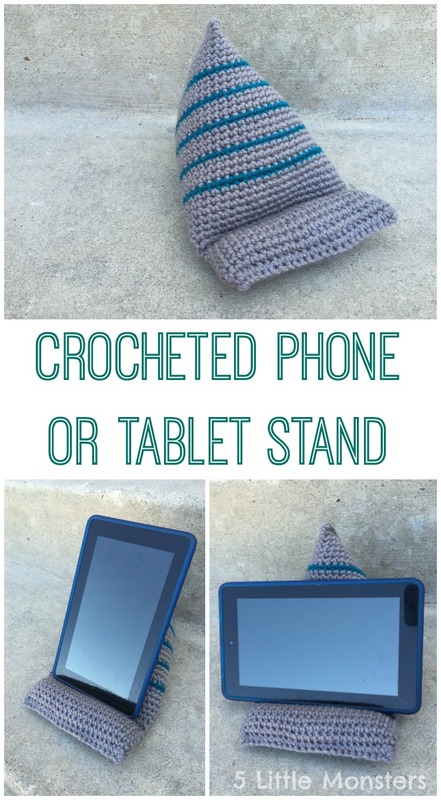 I have seen some pillow type stands that can be used for propping up phones, tablets, or e-readers and thought maybe that would be a fun project. 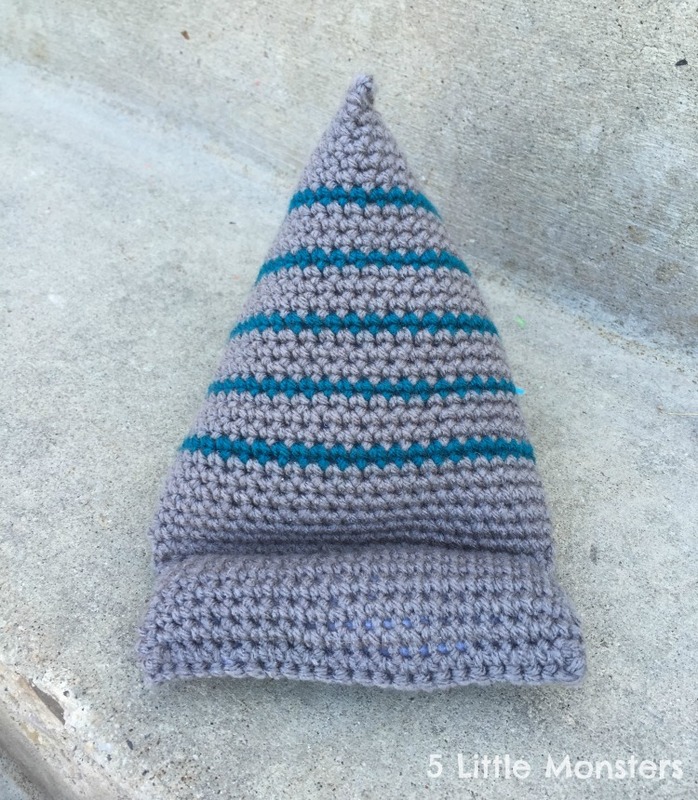 Not too long ago I featured a knitted version in a link party, a little different style but similar idea, and I have seen other knitted versions as well as sewn versions. This is my crocheted version. I made my stand gray with thin teal stripes because I wanted to do something to make it a little more interesting than just a solid color, but also have it be done in colors and a style that would still be masculine. You could easily make it a solid color or make your stripes different sizes or colors. The whole thing is basically just single crochet so you could change colors as much or as little as you want. I feel like it holds a phone, e-reader, or smaller tablet like a Kindle Fire or iPad mini really well, but it isn't quite big or sturdy enough to hold a larger tablet like a full size iPad. 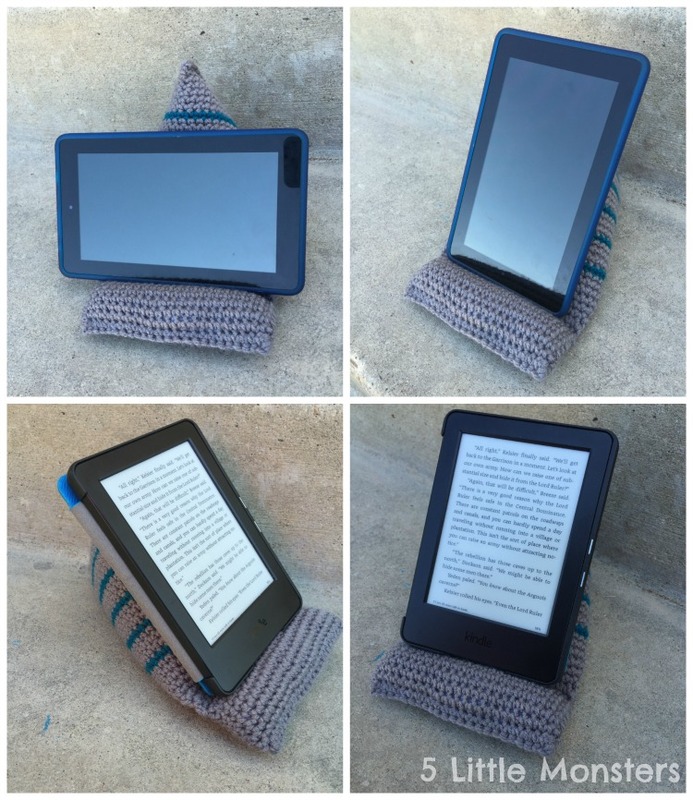 I tried it out with my iPhone, my Kindle e-reader, and my son's Kindle Fire and it worked great with all of them. We also have an iPad and I didn't feel like it could hold it, it does have a big heavy case on it and maybe it would hold it up better without that but I would just recommend it be used with smaller devices. It can also hold them either horizontally or vertically depending on what you need. 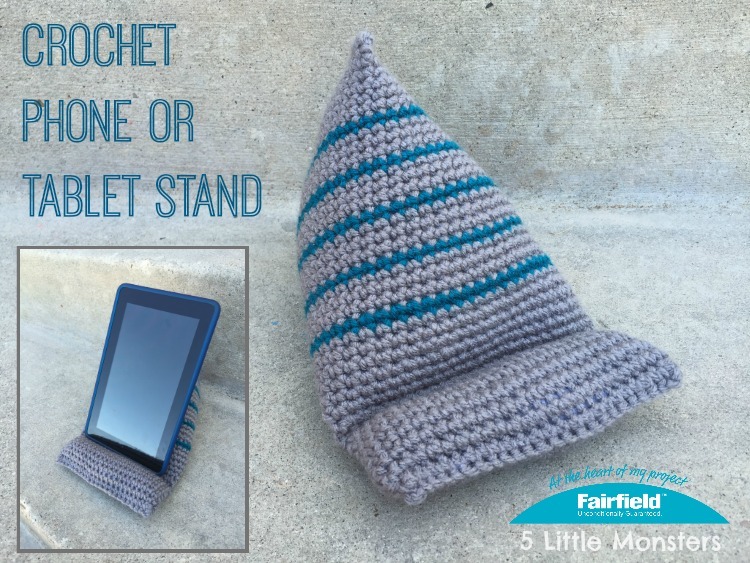 Head over to Fairfield World to get the free pattern for my Crocheted Phone or Tablet Stand. post. Because I am new in blogging and I require great instructional exercise like your post.